Life beginning. Childhood full of friends and dreams. Possibilities endless. Naïve beyond belief. Independent. Taken care of. Indestructible. Independence gone overnight. Memory stolen. Possibilities capped. Doctors on a daily basis. Stability shaken. Youthful stance abandoned. Fatigue unbearable. Accept each day with grace. It won’t be the same. Some days will be good. Some days will challenge the core of your inner being. But life will continue … in a new way. And the only choice is to accept it. Embrace help. Independent people tend to wave away help. “I got this.” But the burden grows when your core has changed. If a loved one was changed in the same way, would you be offended if they didn’t accept your help? Take it. It’s rightfully yours. Live to laugh. Each moment, trial, success and failure is a choice. Cry or laugh? You decide. Laughter truly can be the best medicine. You can find humor in the changes, as grave or insensitive as it may sound now. Aim to live, not please. You will fight to be you again. And your standards will not have changed. But you have. Set expectations. Live life. Pleasing others is the least of your worries. Don’t cower. You will want to apologize for your changes. For forgetting things important. For lack of commitment to friends because you have to be available when doctors can take you. For losing words. You are important. Your health is important. No need to make excuses or be embarrassed. Advocate for yourself. Not necessarily self-diagnosis, but be informed on your own health. You have a right to know what questions to ask and when to recognize “unacceptable healthcare.” You are your best advocate … no need to apologize for “weird symptoms.” If you get 5 “I don’t knows,” it doesn’t mean you are wrong … it just means you haven’t found the most knowledgeable provider yet. Keep searching. 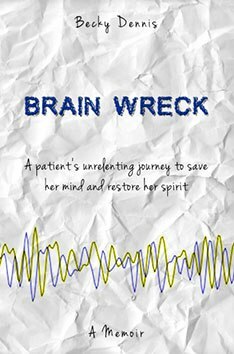 As I wrote “Brain Wreck,” I learned this and so much more as documented in my journey. But in writing this single blog, I’ve reminded myself of what matters. Me. And those like me impacted by encephalitis, stroke, TBI and other forms of what cause a brain injury or disorder. I shouldn’t be ashamed of the compromises I make to “be normal.” Life pre- and post-brain injury are choices. When I face the toughest challenges, I remind myself of these 6 tips of advice.